At the time Mike breaks into the Marshes' home, he takes a few moments to browse 17-year-old Amelia Marsh's room, where he discovers sketches that reveal Amelia's talent as an artist. Mike immediately falls in love with Amelia upon seeing her portrait -- a love that is further heightened when he meets her in person. The duo then proceed to communicate their feelings and thoughts with one another through a series of comic book panels, considering Mike is mute, and sketching is his preferred method of communication. After Mike gets caught up in Mr. Marsh's "extracurricular" business affairs, he realizes that the jobs continue to become riskier. Mike then vows to do one last job as a boxman before quitting for good, so he can be with Amelia indefinitely. The Lock Artist's imagery is vibrant and colorful. It's impossible to get lost and lose track of what's going on, even though the book jumps around frequently between Mike's past experiences as a boxman. Even the connection between Mike and Amelia feels realistic and creative, given the lovebirds are both great artists. I found myself feeling eager to reach the end of The Lock Artist so I could find out why and how Mike became mute. I'll admit that the ending was not what I expected, but I'm satisfied with the story, and will never think about safes and lock in quite the same way ever again. I'm impressed by the amount of research Hamilton put in to learn about the inner workings of lock-picking so he could effectively write Mike's character. 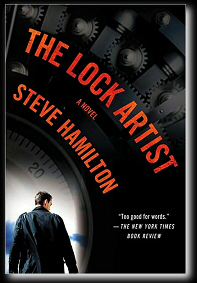 Did you read The Lock Artist, and if so, what did you think? Have you ever read Steve Hamilton's Alex McKnight series? If so, leave some comments and share your thoughts!